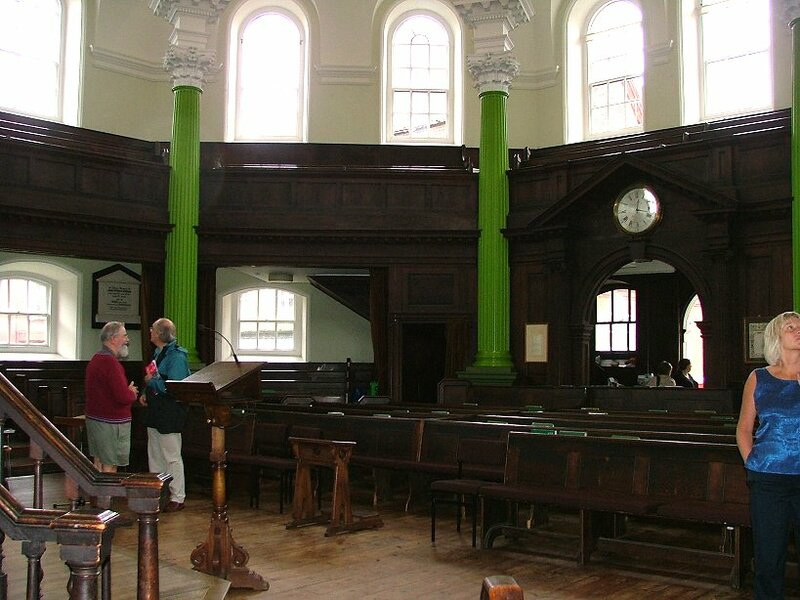 If the Old Meeting House next door is noted for its quiet reserve, a promised land of a building established after years of exile and patient organising, the Octagon Chapel arrived on Colegate with a bit more of a splash. 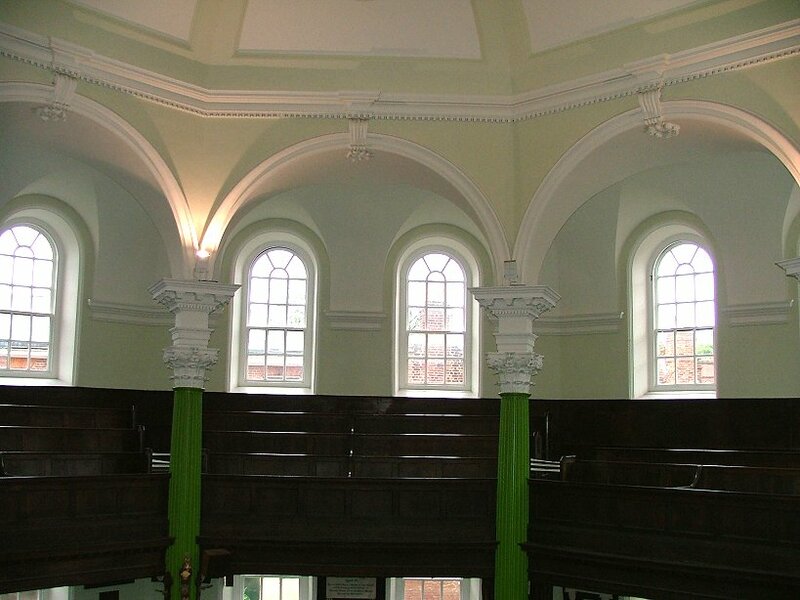 The site had been home to a Presbyterian chapel since the late 1680s, a bit of a comedown for that denomination, considering that it had so nearly become the Church of England during the Commonwealth. But the Presbyterians fell between two stools; they wanted to keep the organisation of a national church, which offended the congregationalists, but they rejected notions of Bishops and Sacraments, which appalled the Anglicans. No wonder both groups were glad to see the back of them after the Act of Toleration. 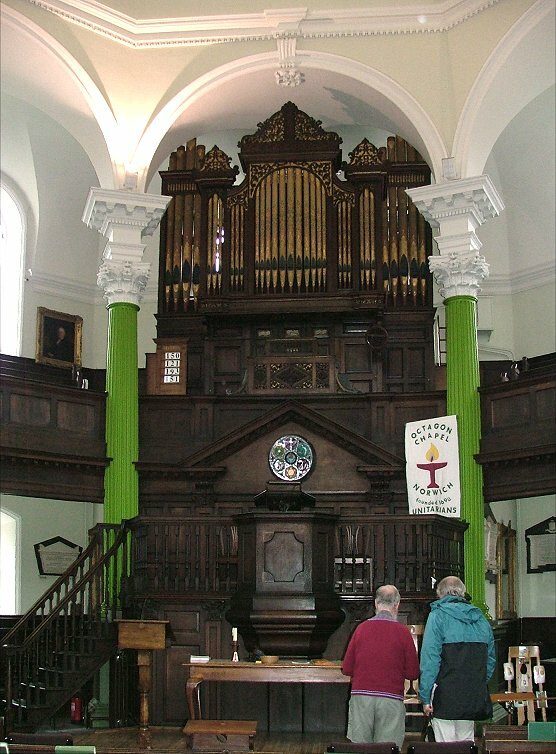 However, the Presbyterians thrived in this fashionable, hardworking area, and in 1756 they pulled down their old workaday chapel and erected this sensational building. 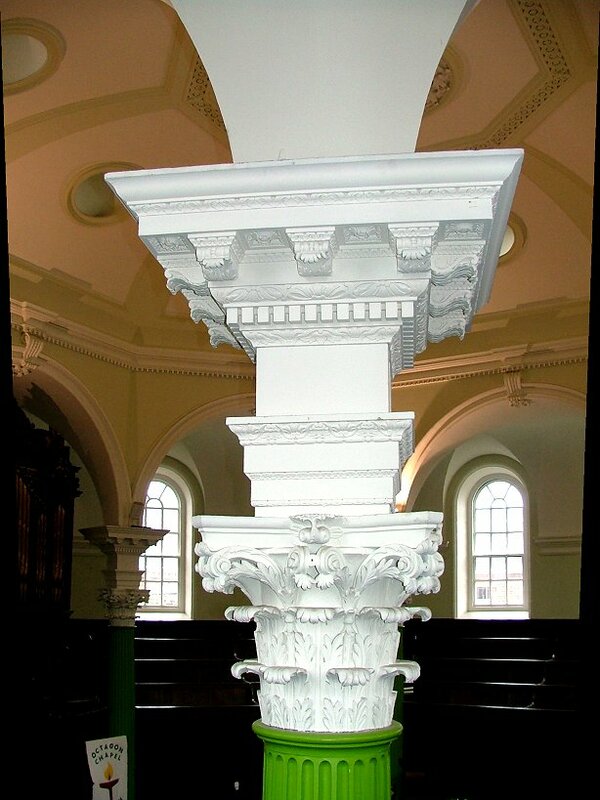 Perfectly octagonal, so that no corners are distant from the pulpit, it echoes the continental oratories which were themselves probably inspired by early protestant churches in the Low Countries. 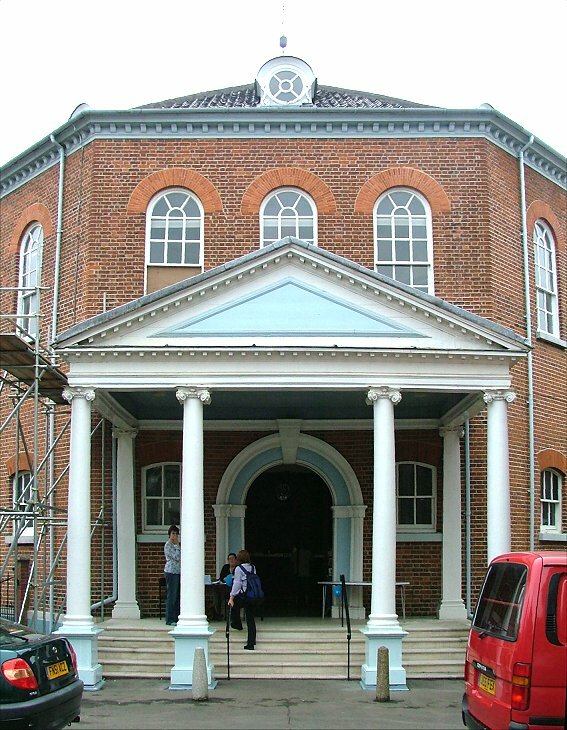 A portico fronts the main entrance, and ranges of arched windows above fill the interior with light, as do circular dormers in the roof. The effect is wholly splendid, and it was the first of its kind in England. If the exterior is striking, the inside is doubly so. You enter an arena of dark wood and cream walls, the shell-like dome of the roof lifted by vivid green fluted pillars that support elaborate corinthian capitals. There is nothing else quite like it in East Anglia; we might well be in Scotland here, in the Kirk of a prosperous 18th century town. The upper part of the interior is so light that you might be underwater on the floor below; climbing the stairs into the balcony is like coming up for air. 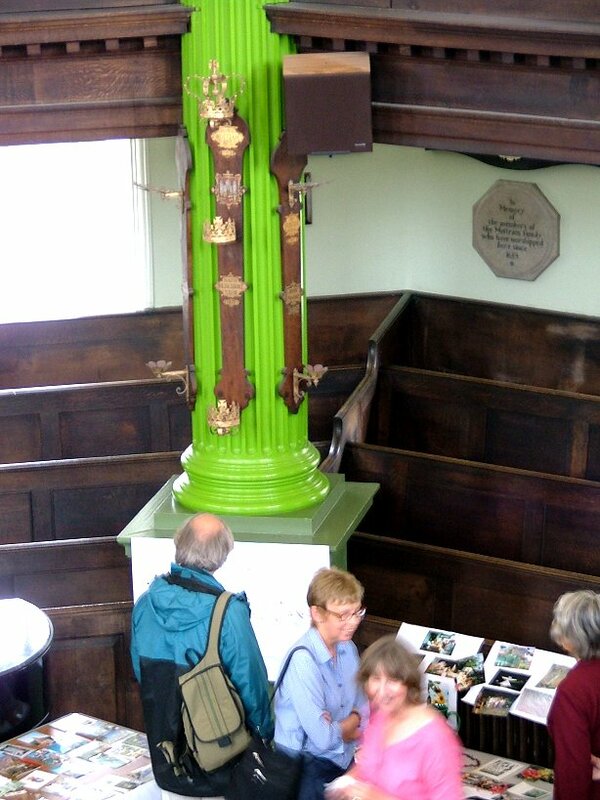 Upstairs or downstairs, everything focuses on the magnificent pulpit and holy table. Surmounting everything is the fine organ. 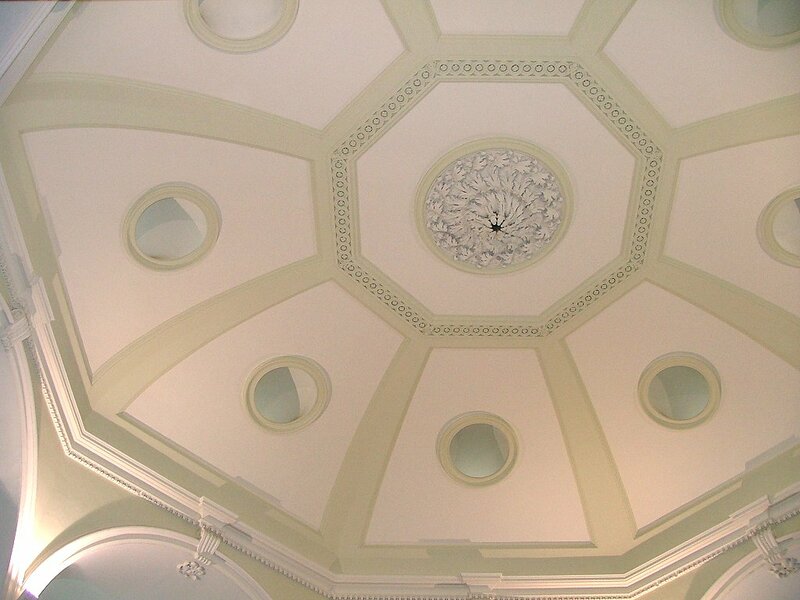 The architect was Thomas Ivory, one of several fashionable architects who tendered for the job. It seems that he used some of the ideas of one of his rivals, James Gibbs, architect of the Radcliffe Camera in Oxford. 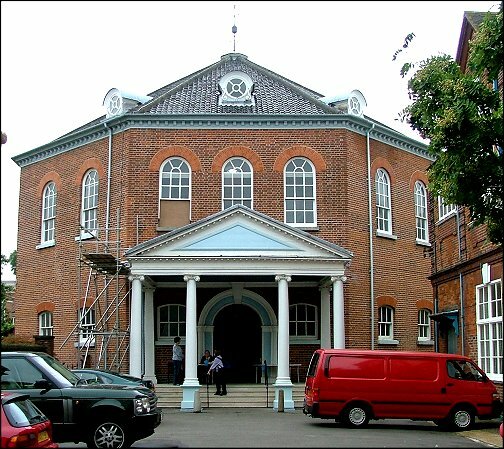 Influential members of the congregation at the time included the Martineaus, who gravitated here with other former members of the French and Dutch protestant churches as they became assimilated into Norwich civic life. 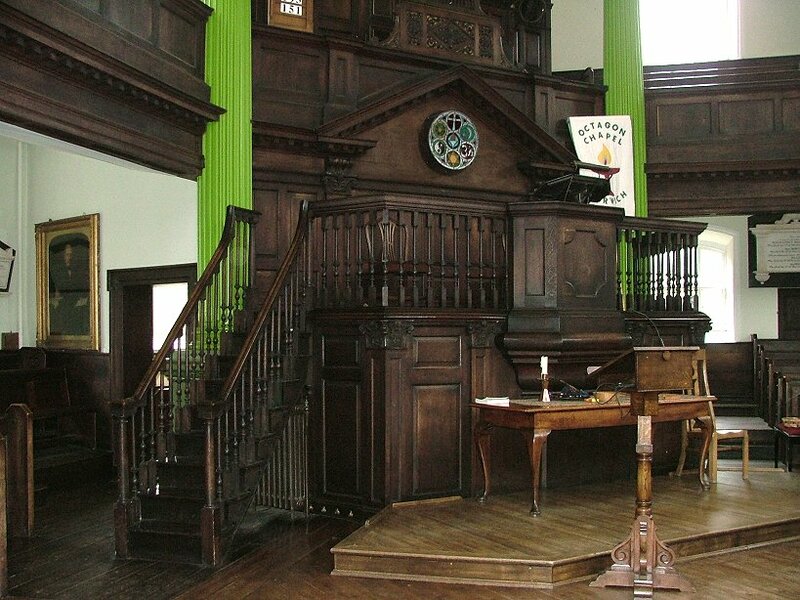 Presbyterianism had no real hold on the English imagination; except in big industrial cities and areas close to Scottish influence, it quickly transmuted into other theologies. 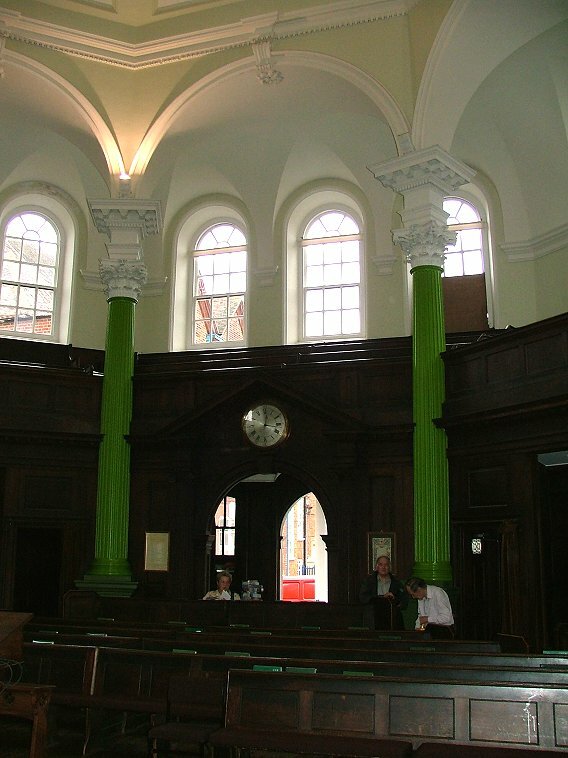 Their rump was absorbed into the new United Reformed Church in the 1960s. 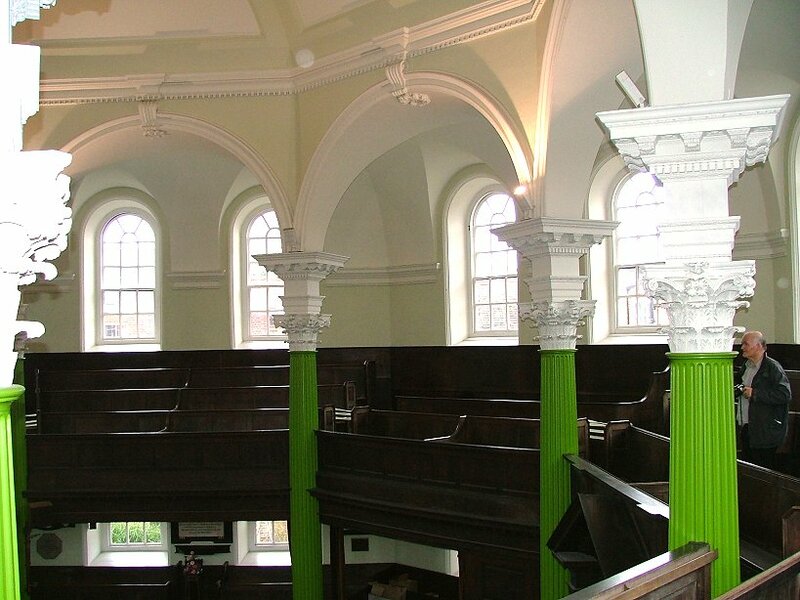 The congregation here at the Octagon chapel had embraced Unitarianism by the early 19th century, and the chapel remains in the care of Unitarians today. That they have continued to be part of mainstream civic life is indicated by the mayoral sword and mace rests which are fixed to one of the pillars. This beautiful building is a delight to visit, an adornment to a city that has so often been accepting of strangers and their energy.